Tomorrow, from 9-10am PDT, the second #1850charla will happen on Twitter. I hope to see y’all there, and perhaps you’ll bring some other time-travelers or just plain old charla-tans with you. Please feel free to spread the word. Last time (February 28, 2014), we had some good tunes, interesting exchanges, and a few job offers! Thank you for the reminder! I will see you there. I hope to see Isabella, Donnie, Mr. Sweetman (blush), and Aunt Renie there. And what about our comadre, Vanessa? And Ciara? Very good! I shall be pleased to attend (but you already knew that, right?) I hope I do not wear everyone out with my venting. The Princess of Florence is doomed; the Queen of France is being blamed for the very war she worked so hard to prevent; difficult times. Being a see’er of truth in such times is an unpleasant affair at best. Ciara wrote an interesting post, “Some Thoughts About Staging,” and how .Re/act was a sort of Improv Stage. The first time I looked at Robert Pratten’s Transmedia Radar Diagrams I thought the words opposite each other were an axis, so a 2-axis diagram. But the axis is actually from the center to each of the words, and it’s really a 4-somewhat-independent-axis diagram. I say somewhat, because I think Story which seems like a top-down idea from a Creator (writer) and Co-Creation which seems like a bottom-up idea from Participants probably interact. 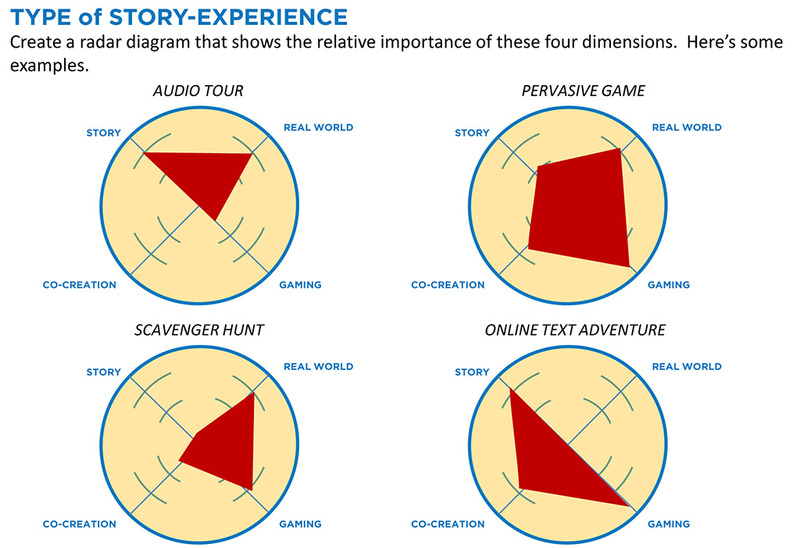 I’m not sure you can have maximum story and maximum co-creation. Safe to say, on the 1850 stage we had maximum co-creation. For me this is the most interesting aspect of cyberspace. IDK why, but somehow using Facebook as it’s intended just isn’t that interesting to me. Yet it seems like such a fun place to play. You could argue that all content on Facebook is “fiction” or at least “manufactured” in the sense that one spends time trying to think of the best way to sound casual and spontaneous. Precisely as Ciara noted, the idea that different people could come and go and chime in as they wished, was compelling. danah boyd just wrote an interesting blog post: Why Snapchat is Valuable: It’s All About Attention. Perhaps .Re/act provided a nice frame for attention / activities. Any identity here could also have blog posts or tweets or flickr images etc, but this stage was a place to showcase / focus the various elements that may have been manufactured elsewhere. Here’s a post wherein I reflect on the relationship between the #1850charla installment of the What’s on [My] Mind? performance project. How does today’s event relate to what I’m doing on March 12, 2014? Okay, February 28 is only hours away, and that’s the day we take our #1850charla to the Twitter stage. I…I don’t really know what’s going to happen, but let’s pretend I do. However, some of you may not have written a “letter,” but you still want to participate. Some may have been using this .Re/act page as your letter. And some of you may have written many missives; you may want to tweet out the whole collection in one fell swoop. Anyone who wants can participate in anyway he or she wants. You will be participating if you use the #1850charla hashtag. Schedule A: Between 9am and 10am PST (5pm to 6 pm UTC), the #1850charla “performance” will take place. If you are available, please join us on the Twitter stage during that hour. We will be chatting about _________________ (I’m still taking suggestions — from myself and others! if you would like to suggest a topic, please post it in the comments here. I’m very open to suggestions right now! Here are some useful resources for prepping for the chat, especially if you’ve never participated in a Twitter chat before. Schedule B: If you are unable to attend the 9am to 10 am PST chat, then please consider contributing to the #1850charla throughout the day; you can do so by posting something related to the topic/s and adding the hashtag #1850charla. On February 29, I will “Storify” or create a custom Twitter timeline for the #1850charla and share it here on .Re/act and via Twitter. Thank you so much for your participation so far. I am truly grateful for your playful and adventurous spirits!! Link for directions about how to customize a Twitter timeline. How wonderful Christa. So this is not the thing called “Tweetchat” but rather a “Chat on Twitter” (with #1850charla) – is that right? And then we can participate about our letters or whatever else for the one hour… or the rest of the day? That is right, Isabella. I think, yes. What you said. I am looking forward to our exchange! LOVE! See you all there. Looking forward to it. Some great stuff written. Sometimes I FEEL like I was born in 1850! I’m worried, so worried about the state of our world. 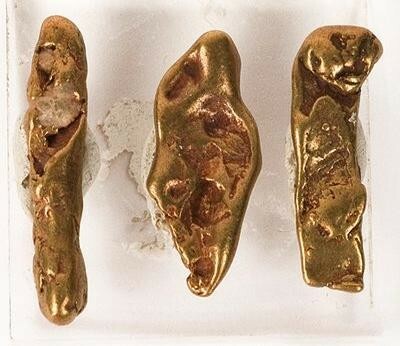 As a result of the hoards streaming into Alta California to plunder the land and the rivers for this gold that they believe the whole land rests upon, much turmoil has erupted. They call our land — which is now newly their land — “the golden state,” but they should be calling it the red and black and blue state because of all the spilled blood and violence being done to get this gold. I have been up to my eyeballs in safeguarding native women and children, refugees to our mission San Juan Capistrano, who have heard rumor that they gain shelter here, gain safety. As I am “la llavera,” I have been taking them in and keeping them in the attic at nights, but we are running out of room! I’ve heard told that there are men in the north full of so much cupidity that their eyeballs are literally turning yellow! Meg, who seems to have a stronger immune system than most (I’m not positive she is human) is perhaps safe on Mars, but as I have not heard anything from the others (sweet Oscar, Donnie — whose immune system I’m sure is dashed due to his lifestyle — Isabella, Mr. Sweetman), I fear that my comadres and compadres have been victims of some new violence or virulence and that the end is truly nigh! 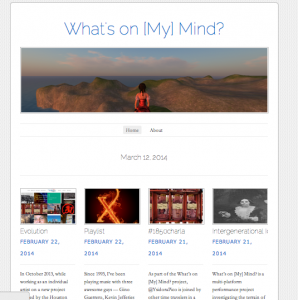 Here is a version of the What’s on [My] Mind? publicity website. Please take a look at it, and if you have a moment, I would appreciate any feedback you might have about what’s working well and about how I can make it better. THANK YOU! (P.S. If you click on the image, it should take you to the link.) (P.S.S. if you click on the #1850charla post on the website, it will give you an initial understanding of how I’m thinking about organizing the charla). Hey Ysi (goes with Izzi) it looks great. And I’ve no problem hanging out with Prima Donnas. Who’s going to throw the best parties the Prima Donnas or the Wallflowers? I’m with the PDs all the way. 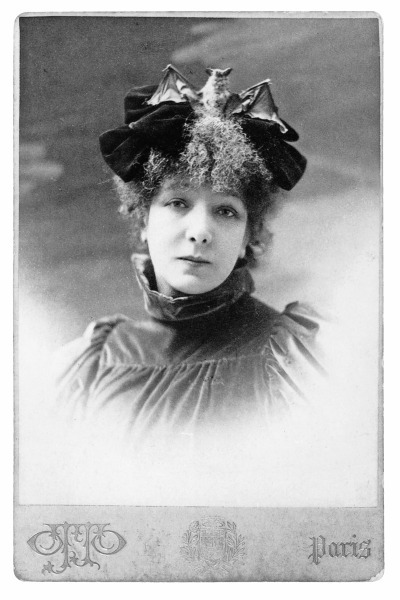 And anyway in a previous life I was Sarah Bernhardt, that’s enough Prima Donna for any man! Ah, Sarah! I love her style! I’ve turned my hair into a nest for birds but never into a belfry for bats! Next up…. The lady is a vamp and a little known influence for Ozzie Osbourn’s stage show. I have finally been granted the ability to speak for myself here. This is ALL I EVER WANTED: to speak for myself. I am terribly glad to be here with you all. Thank you for existing. I’ve been following your adventures and conversations and discussions for weeks now, and I am looking forward to sharing some reports from my own pilgrimage — and, of course, to hear more about yours. Perhaps we shall even create some new adventures together? I can only hope. I don’t know another way to say it, but I probably had an easier life than you. Although I did die at 34, so you may have lived longer. And the last 2 years were sheer terror at the hands of my misogynist / misanthrope brother. Finally, 11 years after my brother Francesco murdered me, my more pragmatic brother Ferdinando murdered him. When Ferdinando turned in his Cardinal’s hat to become Grand Duke of Florence, the greatest wedding, the greatest Medici spectacle, the biggest Theatrum Mundi Florence had ever seen, his marriage to Christina of Lorraine (granddaughter of Catherine de’ Medici) was organized as a year-long event. In many ways “The Medici Wedding of 1589” was the pinnacle of theatrum mundi. I, of course, had been gone and as forgotten as Francesco could make me, for 13 years by then. But I’d always been the Medici who organized plays, events, carnival floats, commissioned music, and celebrated the creative arts in so many ways and brought so much joy and entertainment to the court and to Florence. 1589 was so me. And yet it wasn’t. So too, we’ve all been here prattling on both without you, but also because of you. Perhaps it is not the builder’s place to live in the homes and cities created by their impulse. I appreciated the end of the film Bugsy, where he is unceremoniously murdered for his failure, and then the screen wipes to show the money, power, and spectacle of the modern-day Las Vegas that his vision built, but that he never set foot in. Ysidora, you’ve been haunting my dreams, kid. Good to see you here in the flesh! Dear Isabella, Such a sad paradox about 1589 being so “you” (so because of you) and yet you were not there to enjoy the fruits of your labors–and MURDERED!? ¡Ay, Dios mio! Thank god I was not murdered. But, my son Chico was, the grief of which murdered my husband’s and, soon after, my heart. Although, we were pretty old by then, too, so…. And what IS it with the domineering brothers? Mine (Pio and Andres) married me off to an Anglo as a way — they thought — to protect their property interests in the newly created Alta California — when they KNEW that I was not a fan of marriage. I mean, I was 30 when I was married — in 1836. Clearly, I was not on the marriage plan, but my brothers had other plans for me. I really like the metaphor about the builder not being the inhabitant of the home she builds, although it was her impulse that caused the building to be built in the first place. My granddaughter is a teacher, and this is similar to the way her profession works. Also, Mr. Donnie, you have been dreaming of me? de veras? What portents have those dreams revealed? You know Ysidora, I think the phrase “Bun in the oven” sums up so much of the human condition. Men are “intelligent” beings. Women are ovens. What else do we need to know? Who gets to live in the house is a funny question. As a princess in 1550 I enjoyed so much privilege that almost no one in my time ever did. Yet a poor person in 2014 has so much that a 1550 princess couldn’t even dream of. You know what’s fascinating? The disintegration of the concept that time is a line. It’s wonderful that in 2014, we can speak with our voices from 1550, 1850, 2050. I wondered, Why not imagine how to order time more from our observation of nature; for example, why are the models for how we live not like a blossom that loses its petals not one by one, not in a linear fashion, but rather in clusters, dumping out its heart as it reaches for the sunlight, as it draws up earth’s moisture through its roots? Why do we not mark time as the sea does: eternal waves swelling and breaking one after the other, sometimes more, sometimes less? Is it because we don’t know how to depict this motion? Is each lifetime a wave in a sea? Is each wave a moment in a life? These are the kinds of things I thought about while I was growing toward my 30th year, where I thought I was safe from marriage. Instead, in my 30th year, my cultural life replaced my natural life: I became a mother to three children, Marcos, Chico, and Juanon. My days were in no way linear — they were for a long, long while merely endless repetitions of the same thing over and over — feeding and cleaning, cleaning and feeding. Once the boys could clean themselves, it was feeding and educating, educating and feeding. Having children reduced my poetic questions to a reality of drudgery. I realized that the idea of linear time is thrilling: it provides hope that things will change, that one’s conditions can change. And, of course, we change and change and change and then we die. What’s thrilling is that I have come back to life! It defies my imagination, but apparently not enough to stop me. Hi All, I’m coming to the party late. And now that I’m here a little slow to get going. It may be at the tail end of the industrial revolution but I’m still a bit of a ludite. Anyway with party in mind the least I can do is bring the beer. Beer? Hi Patrick! You run a pub? Oh wow! Donnie is going to love you!! But watch out for that Oscar, I think he’s a prohibitionist! For our “PBR Discussion” I thought we might take a look at the interview Rhizome published in Dec between Italian critic/curator Domenico Quaranta and German experimental video artist Matthias Fritsch of Technoviking fame/infamy. sounds great! 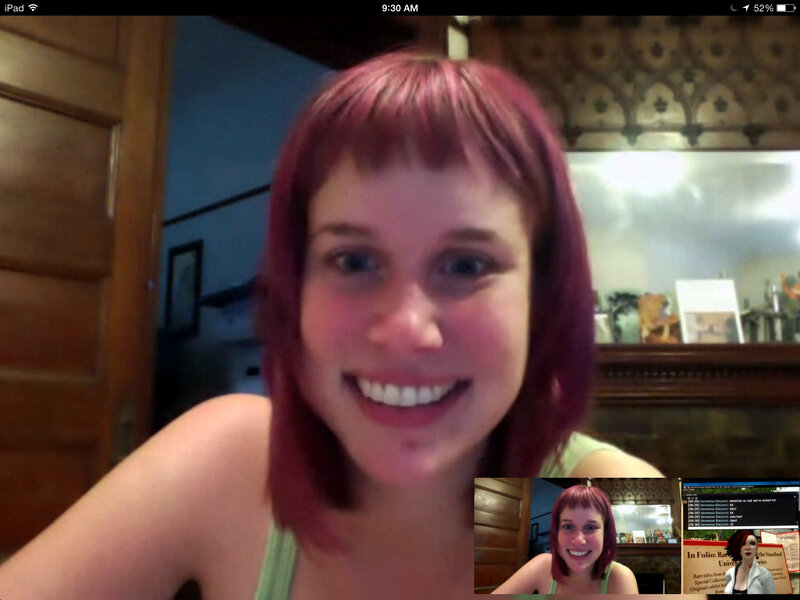 I have another video chat scheduled right before so I may be a minute late logging into Blueberries. It’s a lot on the agenda but I look forward to hearing updates about everyone’s projects. Talk to you monday! Hi Molly, Michael & Christa… I’ve not heard from Katrina or Rebecca yet… so we may be short of our “6 Blueberries” this month… what do you think of inviting someone else to sit in with us? Like Ciara? Or Kate? Or? That might be diluting the Blueberry “team.” Or it might be maintaining the team across natural evolution. Any thoughts or preferences?